Do you fear wearing fur? Fur coats, vests, and scarves generally bring a more luxe flavor to an outfit. In fact, you could be wearing a sack underneath, yet still look like a million bucks if you have fur on. And the best part about fur is that whether it’s the real deal or synthetic (faux fur meant to look like the genuine article), you still get the same glamorous effect. Fur is a statement in itself — even when it comes in black, white, or neutral hues. What’s more interesting, however, is that this year, fashion took fur to a whole new level by turning it into a trendy piece filled with color — as in, real color like purple, plum, cobalt, yellow, and more. This “color treatment” is especially rampant among fur scarves. 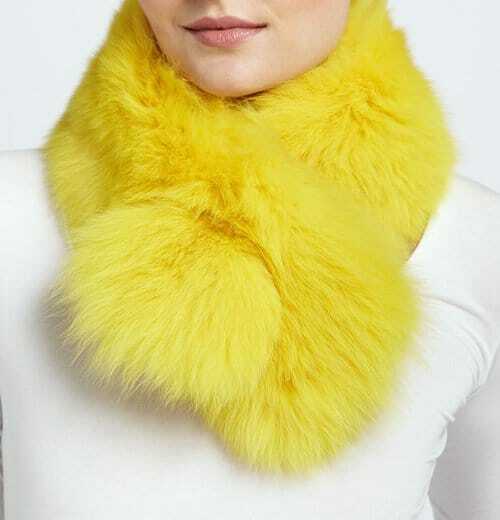 So here’s a question for you: do you think you can handle wearing colored fur around your neck? Will you rock a piece and give it enough justice? The safest way to wear colored fur is by pairing it with classic separates in neutral colors. You can stick to black or white, or try other neutrals like grey or brown. The idea is to make the rest of your outfit fade into the background so your colored fur (scarf) can take the spotlight. Here’s Rita Ora sporting a red fur scarf with her black-and-white attire. As you can plainly see, it’s a fail-safe combination. Even with an unflattering pair of leather pants, she still looks decent. To give another example, here’s fashion blogger Emily Lane from ‘Emily Lane Style’ sporting a green fur scarf with her all-black outfit. It’s a simple yet stunning combination, don’t you think? Her blog is unfortunately no longer available online. You CAN wear a colored fur scarf and sport other accessories (or separates) in the same hue as well. But be sure to keep the rest of your outfit neutral and classic. A great example for this would be the outfit we spotted on Lisa Vanderpump back in Januaryof this year. She wore a purple scarf with a purple dress and heels. The British restaurateur toned down the color by rounding off her outfit with a black coat. Also, here’s another color-coordinated look from a fashion blogger, Lucy from Style Without Limits. She actually used three different neutrals with her colored scarf and pants — black (bag), khaki (coat), and dark brown (boots). Your colored fur scarf is already quite a statement, but that doesn’t mean you can’t wear accessories or separates that are as busy or as colorful. The key is to pair in moderation. You can mix your scarf with a pretty print or with another color that is equally loud, but you need to remember a few things. First, if you want to wear your scarf with another (solid) color, choose only one. If you have to push it, make that two. The choice can be in the same color family or opposite to it (refer to the color wheel for this). Also, always remember to tone things down with neutral pieces. Allow us to demonstrate this a little further with pictures of Sienna Miller and fashion blogger, Emily Lane. Now if you want to mix your colored fur scarf with something printed or patterned, feel free to do so — but again, in moderation, and with perfectly appointed pieces. Follow the color rule (i.e. same color family or opposite color) and be sure to stick to a maximum of three colors for the whole outfit. Choose small or medium sized prints. And always tone down the flashiness with classic or neutral add-ons. Fashion blogger, Ariel from ‘Fashion Devotee’, pulled off this mix brilliantly so we’re going to use her outfit as the perfect example. Her blog is unfortunately no longer available online. So are you ready to rock some colored fur this season? Here’s a poppy yellow option that would be perfect if you want to try these looks. This one is from Adrienne Landau and is made of dyed fox fur. Do you like it?